Kettlebell Sumo Deadlift is a great exercise to target the posterior chain which is composed of the glutes, hamstrings and lower back. It also works the posterior deltoids, traps and upper back. Kettlebell Sumo Deadlift actively engages the core section to support the lower back and maintain correct upper body position throughout the exercise. 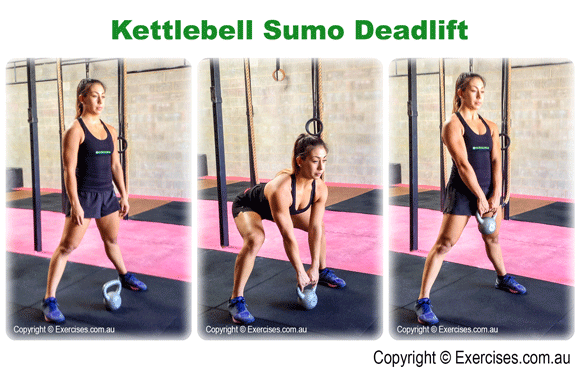 Kettlebell Sumo Deadlift will help build strength, balance, stability and power. Assume a “Sumo” stance; feet wider than shoulder width. Both hands on the handle of the kettlebell which is positioned between the legs. Arms straightened out. The kettlebell should be in line with the shoulders. Shins are vertical. Hips are higher than the knees but lower than the shoulders for a stable flat back position. Push your heels through the floor and extend the knees. When the kettlebell is below knee level, push your hips forward to bring the kettlebell above knee level which is the top position. Straighten out your legs. Bend at the hips then the knees to return the kettlebell to starting position. A common fault in Kettlebell Sumo Deadlift is starting the exercise with a rounded back which puts the lower back in a vulnerable position. Another common fault would be to straighten the legs at the first pull which exposes your lower back and hamstrings to injury. As a variation of the Deadlift, always start the pull with your legs.